Why Does Netflix Block VPN Traffic? Do Free VPNs Work with Netflix? Why Is Netflix Better with a VPN? The VPN you are using is unable to bypass detection from Netflix. With hundreds of VPNs and proxies out there and millions of potential IP addresses, it’s not surprising that some are blocked. Don’t just give up on watching US Netflix if you see the streaming error that says “You seem to be using an unblocker or proxy” check out the two quick solutions we have for you. But when we connected with ExpressVPN we have no trouble watching anything we wanted. It happens from time to time that even the VPNs that can access Netflix have a server or two that get flagged and blocked by Netflix. You can either use a trial-and-error method and just choose another server and refresh your Netflix page. Another solution is to speak with a customer service rep and find out which server to use. During our recent test, we ran into a Streaming Error when trying to watch Netflix on ExpressVPN , while we were in the US and connected to a US server. We checked in with their 24/7 live chat help and they told us which servers to connect with from within the States. Film studios sell country-specific broadcasting rights to cable, satellite, and streaming service providers. Companies like Netflix must purchase the rights for every country it wants to provide programming. Cost and regulatory restrictions play a large part in consumer access to content. Netflix, headquartered in California, offers its US subscribers the largest selection of movies and shows. The content lineup across other countries can vary widely. Consumers fight back by using VPNs to cloak their location, giving them access to content from anywhere in the world. In response to the growing use of VPNs to circumvent geo-location blocks, copyright holders in the film industry have put more pressure on streaming services, like Netflix, to stop users from gaining access to content outside of their designated country. Under pressure from the film industry, in 2016, Netflix announced that it would block users from viewing content through a VPN, even when watching in their home country. That being said, we have not heard of a case or received a message from any of readers, that Netflix has blocked someones account for using a VPN. ExpressVPN has a large server network to overcome geo-location blocks from companies like Netflix. The software automatically chooses the server with the fastest speeds, but you can manually run a speed test on your desired server location to ensure fast download and streaming speeds. 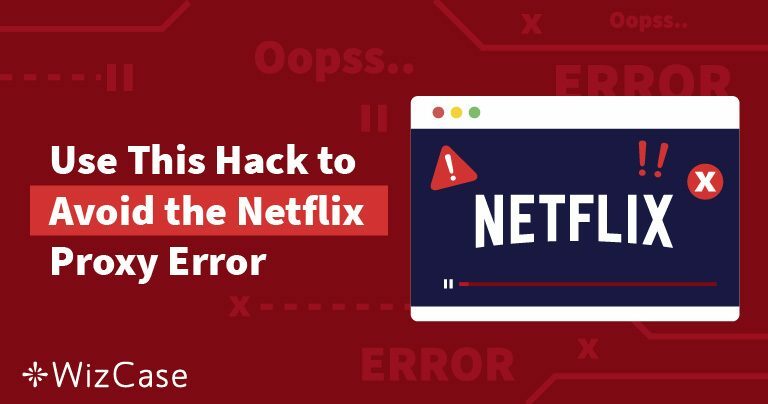 Should you experience the dreaded Netflix error, connect with 24/7 customer support through a live chat, and they can provide a list of servers that will bypass the geo-location block. Add military-grade encryption, a no-log policy, and split tunneling, and ExpressVPN is our top choice. NordVPN services the largest server network among premium VPN companies. SmartPlay technology optimizes connections speeds, combined with the unlimited bandwidth, making it an excellent choice for streaming Netflix. In addition to server access at the fastest speeds, the company also provides 256-bit encryption, ad blocking, and an auto kill switch to ensure a safe streaming experience. Users can connect to six accounts simultaneously and have a 30-day money back satisfaction guarantee. CyberGhost offers fast and reliable connections that bypass digital censorship and geo-restrictions common among streaming services like Netflix. They use the OpenVPN protocol to hide your IP address and cloak your location. The service provides ad blocking technology with no buffering or throttling for a better streaming experience. The company has over 3,800 servers in 60 countries and offers 24/7 customer support and a 45-day money back guarantee if you have trouble with your connection. SurfShark places a private DNS on each server and allows you to stream through multiple countries to strengthen your anonymity. The company has a strict no-log policy and a kill switch to ensure a private and safe connection. The service allows you to connect with an unlimited number of devices without bandwidth restrictions. To get the lowest price, make sure to check out our Surfshark Coupon. Slow speeds and limited bandwidth: Free VPNs tend to restrict both bandwidth and download speeds, which can lead to buffering, time outs, and interruptions when you want to stream a movie on Netflix. Netflix continues to ban servers: VPN companies without an extensive server network will be unable to get around the Netflix VPN blocking software. VPN services must employ additional security and cloaking devices, have a large number of servers across the globe, and refrain from keeping activity logs, to avoid detection. Free VPN services typically fund business costs by selling user browsing information to third parties, which means it must maintain activity logs. Companies also limit the number of servers you have access to, which makes it easier for Netflix to block. Fast speeds: VPN connections add a layer of protection but can slow down streaming speeds. Optimization server connections and automatic speed tests can ensure you have the best connection. No-Log Policies: The goal of a VPN is to cloak your location and hide your identity. VPN services with no log policies, delete the browsing history at disconnection, preventing companies from connecting you to your online history. You can browse, watch, and buy on the web without disclosing your identity. Security: A premium VPN can protect your information as well as your location. Military grade security and 256-bit encryption not only mean you can safely stream but also protects you from hackers. An abundance of servers: Choosing a server located near your true location will impact streaming speeds. When the VPN service offers thousands of servers, the traffic on each server is lower, and you can choose one closer to your true location, which can speed up streaming speeds. Netflix actively blocks users from accessing their content through a VPN. Whether you are traveling, want to watch movies available in another country, or demand anonymity and identity protection while at home, watching Netflix through a VPN service will limit censorship and protect your privacy. Use our recommended VPN services to avoid geo-blocked restrictions and watch American Netflix today.